THORNBURG, Va. — At 10 a.m. yesterday, a refrigerated truck carrying approximately 1,000 cases of Richmond-made Stone Brewery beers overturned on Interstate 95 near Thornburg. The cause of the accident has been attributed to an unknown mechanical failure; however, numerous Twitter and Facebook posts reported that the accident has left the highway completely and utterly lit. In what could be called a “slow-speed accident,” the truck overturned through no fault of the driver and without colliding into any other cars. The truck was brought to a slow stop but the momentum was enough to tip the trailer over, spilling a large portion of beer into the adjacent forest and depositing several intact cases of beer onto the highway. While the driver made immediate efforts to manage the mess and the loss of cargo, he discovered too late that forest animals were partaking in the puddles of hoppy brew. He was busy contending with a drunken stag when other drivers arrived at the scene and immediately joined in on the accidental fun. 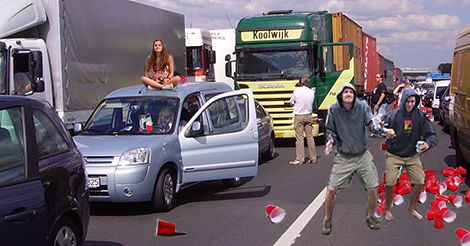 The affected quarter-mile of interstate swiftly devolved into a slovenly mess as more cold ones were cracked. Even emergency personnel responding to the accident elected to “slam a free one” before engaging in any accident management efforts. Some particularly inventive partiers started playing a modified version of beer pong, utilizing a beach ball and 12 cars with their sun roofs open. The unbridled revelry did not conclude until almost midnight, when drunken former-drivers abandoned their cars on the highway and called Ubers going the other direction to take them home. At press time, the northbound side of the highway remained completely blocked as a group of raccoons refused to vacate the truck, intent on consuming all of the remaining beer. Despite a near 24-hour blockage, drivers heading northbound on 95 still insist this level of traffic and delay is manageable. “I’ve seen worse,” said frequent Richmond-to-NOVA commuter Todd Phillips, who was sitting in his parked car with both feet out of the window in the middle lane near Doswell.